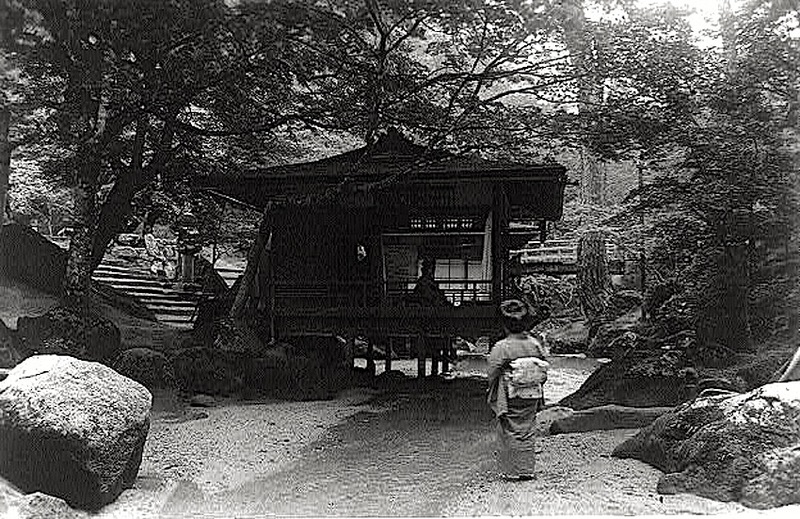 “Tea house in a woodland, Itsuku-Shima, Japan,” between 1890 and 1923, photographer unknown, via the Frank and Frances Carpenter Collection of the Library of Congress Prints and Photographs Division. The garden may be on Itsukushima Island (now called Miyajima). I’m sorry there was no Sunday porch two days ago; there was also no weekend internet service in our house. Fill all the dawn with wonder? In the deep and woody glen! This wonderful photograph captures the peacefulness and beauty of the place. I particularly like the arrangement of the house over the stream. It’s incredibly frustrating when internet fails, or when it isn’t available, as was the case when we were in Botswana last week. I was looking forward to an internet-free week but found that I felt so cut off… didn’t like feeling that way but that’s how it was. I do so enjoy the Sunday porch posts. I visited the McLean House at Appomatox when I was a child, and recognized it immediately. I went back to see it about 10-15 years ago and didn’t particularly like how the place had been ‘parkified’ even though I understand why that has happened. I’m from Virginia, but I’ve never been to Appomatox. So I was surprised to learn that the house had been taken apart and then put back together. The setting is perfect. Imagine the water splashing on those rocks! It’s one of the prettiest stream beds I’ve seen.